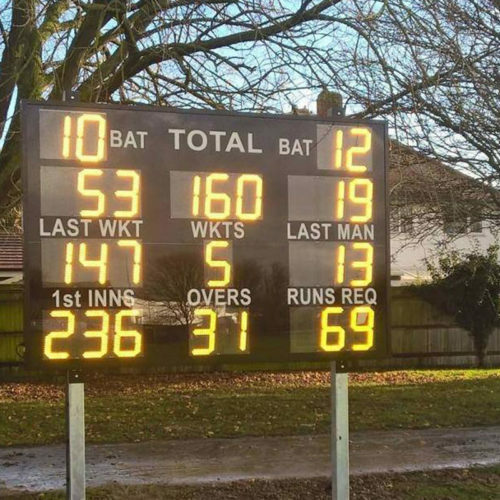 From professional county cricket grounds to small village clubs, standard, bespoke and custom electronic cricket scoreboards are available to enhance spectator enjoyment and the overall impressions of grounds. Our technicians will happily survey any club’s facilities and provide a tailored scoring solution to suit all requirements and budgets. 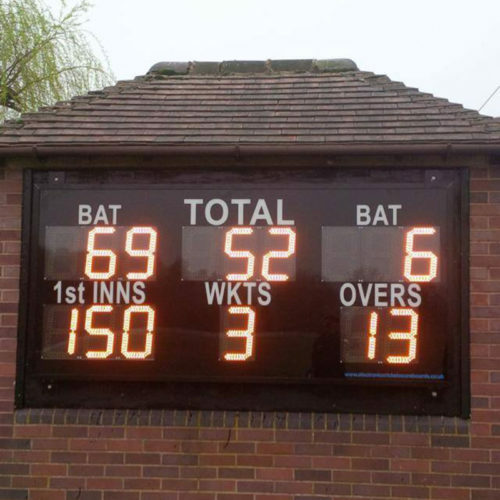 Services include the supply and installation of standard cricket scoreboards such as the DC9, DC15, DC19, DC22 and DC28 as well as the upgrading of existing facilities by replacing the fascia and fitting the digits to an agreed layout. ECS enjoys a strong reputation for delivering high-quality, reliable products, supported by first-rate service. Please contact our sales office today for further information or a site visit to discuss your specific requirements in more detail. This table will help you to identify the right standard scoreboard for your needs and provides a link to the relevant web page by clicking the product name at the top or price at the bottom. This nine-digit scoreboard is viewable from 183 metres. 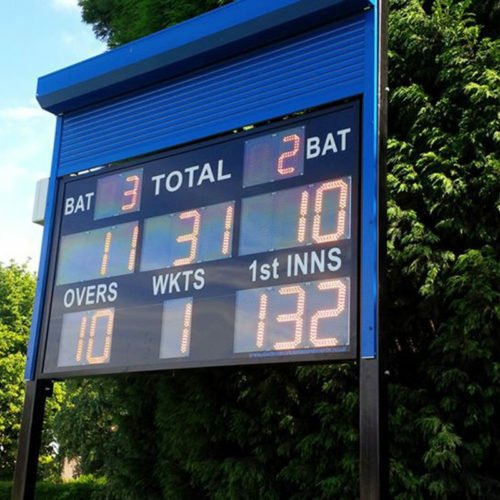 The DC9 is an ideal cricket scoreboard for displaying basic information during a cricket match. 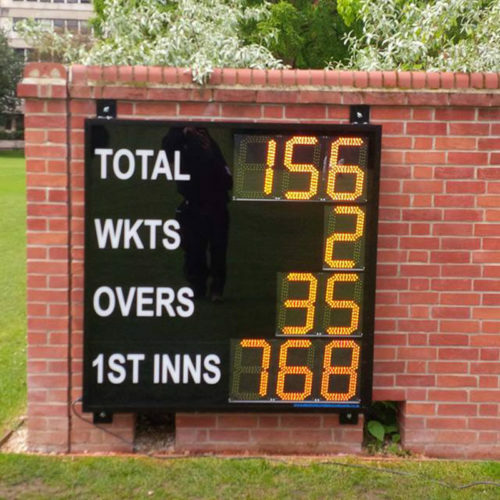 This mid-sized scoreboard allows all key information to be displayed and it can be operated wirelessly from a distance of up to 250m. The DC19 model, features the same information as the DC15 but with the addition of batsmen’s IDs using 10” digits. The DC22 also includes the Batsmen’s IDs but in 12″ digits as opposed to the 10″ digit used on the DC19. The DC22 also has the extra addition of Last Man or Last Wicket. This scoreboard provides a superior mid-size display for both spectators and players. The DC28 has an extra six digits and includes a choice of Last Wicket, Runs Required and Duckworth Lewis. We provide a full design and build service of existing score boxes and can also supply and install steel-framed wooden-clad structures as an alternative to the above boxed models. We have carried out numerous installations on all shapes and sizes of box. Please visit our website to find a scoreboard installation near you. 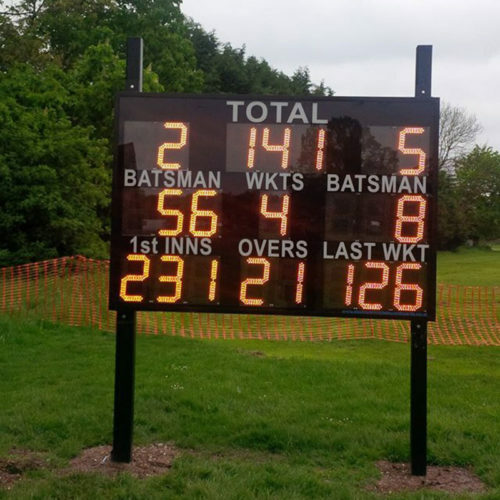 For more information on Electronic Cricket Scoreboards visit our website, call us on 01572 822013 or contact us with a few details of your scoreboard project.